Our goal is to restore each patient to his or her previous ability. While we understand that this is not always possible, we believe that this high standard of care is what enables us to help so many achieve and even exceed their personal rehabilitative goals. Learn more about our rehabilitative philosophy and contact us to schedule a tour or start the admissions process. 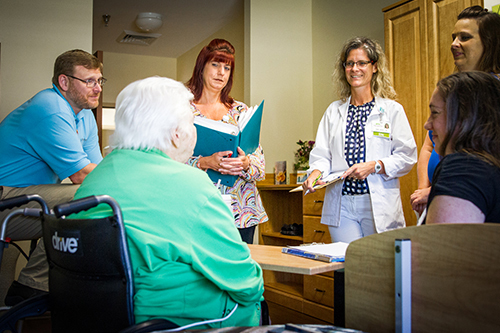 Our team of skilled care professionals perform preliminary evaluations for each patient. Following this evaluation, the entire rehabilitation team meets to develop a full-scope, personalized rehabilitation plan. Then, the team meets with the family to discuss the plan and ensure that everyone is working together to provide the care necessary for each patient. Physical therapy begins soon after the initial evaluation, even while the patient’s care plan is being developed. This intensive therapy is designed with the goal of helping the patient reach 100% of their prior function. Modalities such as electrical stimulation and ultrasound enhance the benefits of physical therapy allowing the patient to recover faster. They may also help reduce pain, which allows for longer therapy sessions to improve recovery time. The diathermy stimulates the area around a wound to draw more blood and promote faster healing time. The end of the stay is not the end of the care. 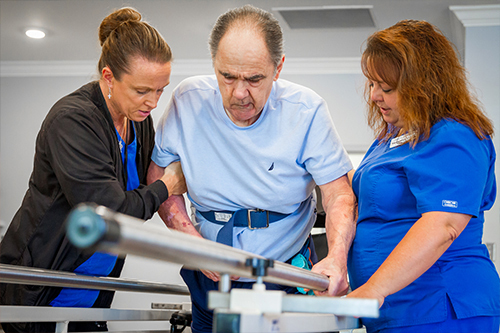 We believe that rehabilitative care doesn’t end when a patient is ready to exit the facility. In order to maintain and continue to improve the patient’s function, their care must continue. To help facilitate the return home, we’ve developed a complete protocol to help patients and families transition to their normal lives as easily as possible. As a patient begins to exhibit signs of improvement, the care team then plans to send the patient home. 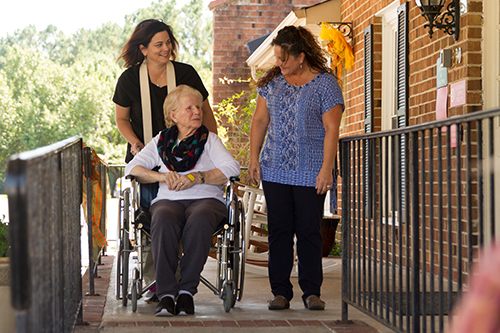 Upon admittance, we work closely with the patient and their loved ones to define each step on their road home. In-depth collaboration with the patient and family determines the safest and most effective way to return the patient to the comfort of their home life and if any adjustments to their routine are needed. Before rehabilitation, we establish criteria such as if the patient will need to navigate steps or stairs, if they will be living with someone else, and their need to drive or cook their own meals. When the patient is nearing their time to discharge, their abilities are evaluated against their individualized criteria to ensure a safe return to their home. A home visit and evaluation to assess the patient’s progress with their household situation can be included as they reach their End of Therapy Plan. All of these steps help to ensure that a patient can return home and stay home. We pride ourselves on keeping readmissions to a minimum and try to equip patients and their families with the necessary tools to continue rehabilitation at home. We believe that our patients should return to their regular lives as quickly and as completely as possible, and each step of our rehabilitation plan—from evaluation to end of therapy—is intended to facilitate this goal. In addition to our complete rehabilitative care services, we offer a variety of other physical therapy services as well. 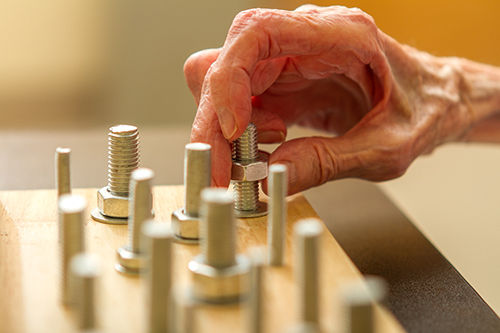 As part of our goal to help patients return to their previous ability, we have intensive occupational therapy programs. These programs are intended to help patients regain the function of daily life and return to normal activities as quickly and as completely as possible. While it is always the goal of the facility to assist all residents in their efforts to achieve maximum medical recovery, please be advised that clinical conditions can change which will necessarily affect the rehabilitation plan of care, timeline and goals. The facility will always use its best efforts and knowledge within the standard of care to achieve optimal results for every resident, but the facility cannot guarantee a specific outcome with respect to the healthcare of our residents.